Approximately fifteen years ago, Weston residents were divided over how to invest in our town's future; some felt strongly that our resources should be put toward investing in our schools and infrastructure, while others wanted to keep an increasingly burdensome tax rate from escalating even further. The situation went from mild disagreement to ugly and litigious in short order and the debate raged in the courts - and in the courts of public opinion - for far too long. Almost a half generation later, we find ourselves on a familiar precipice; one with no clear winners or losers and coming at a time when our much-needed resources can, and should, be put to better uses.No one seems to be debating that the two primary reasons that most of us moved, and remain devoted, to our town are the amazing public schools that we have built and lovingly-fostered and the bucolic, rural and peaceful nature of Weston as a whole. We value our educators and our open space. And we enjoy keep our downtown intimate, familiar and family-friendly. In exchange for the above, Westonites have paid the price in the form of rising taxes, slow growth and a suspended hopes for the completion of our schools. We accepted that taxes would continue to rise to the highest level of similar-sized towns in the state. We set aside that we did not finish what we started with the school construction and renovation project. And we fought hard to maintain the things we we cherish, while building value in our homes and properties. 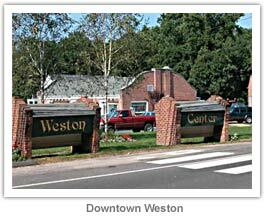 The Weston Village District Coalition was formed as a result of an unusual convergence of circumstances and timing. Having learned from the past and being unwilling to allow those very public battles to occur, we began talking about the positives - what we loved about our town; the things that make it characteristically Weston. In moving the conversation from the negative to the positive, we found that there is, indeed, a solution.In 1998 the Connecticut General Assembly passed The Village Districts Act, intended to aid municipalities in protecting regions in their towns by empowering zoning commissions within designated districts. The Assembly likely assumed that this Act would be used to aid historic preservation or put restrictions on growth. They could not have known that just a decade later a confluence of factors would see a small town, instead of being torn between difficult choices, relying on this legislation for a solution.